Felicity Cantrill - Graphic design: Tie-dying... in reverse! 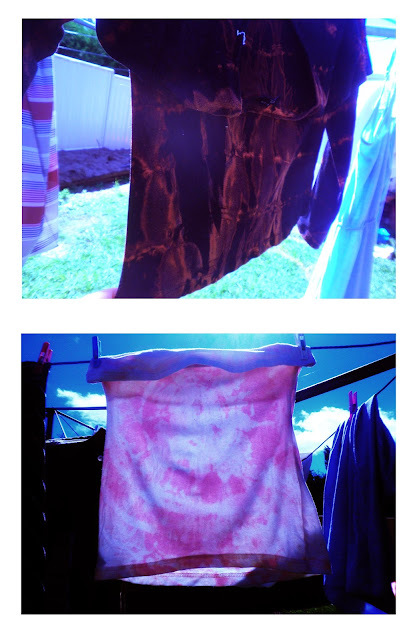 Here are some old garments I have 'reverse tie-dyed' . This basically involves the same method as traditional tie-dye, (you know, the rubber bands, the rubber gloves) except instead of dye, you use bleach. You can dilute it and submerge the item, or spray on straight bleach. Results may vary... The thing is, you never know how the manufacturers mixed the dye that's on your fabric. As you can see with the first top below, it was black when I started, and occasionally, you will get a 'true black', which, when bleached will go grey. But mostly, you will get a brown/orange colour where the bleach has touched the fabric. I once reverse tie-dyed a purple shirt that went pink, blue and white, depending how much contact certain parts of it had to the bleach. Use gloves, and something to protect your eyes (goggles, sunglasses) . Rinse garments well, then wash them straight away, to avoid the bleach eating away at the fabric, and your clothes falling apart.